The use of high resolution models in small-angle scattering data analysis is considered. The methods to compute X-ray and neutron scattering patterns from the atomic models of particles in solution are presented (Svergun et al., 1995; Svergun et al., 1998). Possibilities for validation of the crystallographic structures in solution (Svergun et al., 2000) are demonstrated. 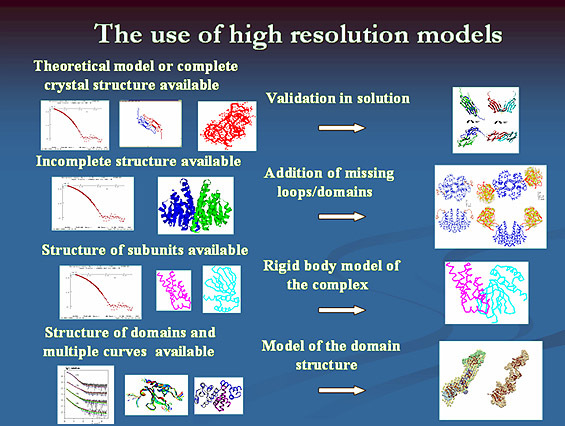 The main idea of rigid body refinement in terms of subunits, domains of structural fragments is given (Svergun, 1991) and the methods for automated and interactive refinement are reviewed (Konarev et al., 2001; Kozin & Svergun, 2000; Petoukhov & Svergun, 2005), including the simultaneous use of SAXS and SANS with the information from other methods (Petoukhov & Svergun, 2006) and also the possibility to add missing linkers (Petoukhov et al., 2002; Petoukhov & Svergun, 2005). The presented methods are illustrated by practical applications. Konarev, P. V., Petoukhov, M. V., & Svergun, D. I. (2001). J. Appl. Crystallogr., 34, 527-532. Kozin, M. B., & Svergun, D. I. (2000). J. Appl. Crystallogr., 33, 775-777. Petoukhov, M. V., Eady, N. A., Brown, K. A., & Svergun, D. I. (2002). Biophys J, 83, 3113-3125. Petoukhov, M. V., & Svergun, D. I. (2005). Biophys J, 89, 1237-1250. Petoukhov, M. V., & Svergun, D. I. (2006). Eur Biophys J, 35, 567-576. Svergun, D. I. (1991). J. Appl. Crystallogr., 24, 485-492. Svergun, D. I., Barberato, C., & Koch, M. H. J. (1995). J. Appl. Crystallogr., 28, 768-773. Svergun, D. I., Petoukhov, M. V., Koch, M. H. J., & Koenig, S. (2000). J. Biol. Chem., 275, 297-302. Svergun, D. I., Richard, S., Koch, M. H. J., Sayers, Z., Kuprin, S., & Zaccai, G. (1998). Proc Natl Acad Sci U S A, 95, 2267-72.